Cited in Labrador, Ana P., Homage to the Masters 2 The Artlink Group, Inc. Achievements Award Mees’ Music Foundation of Guimba, Inc.
Cited in Duldulao, Manuel D., The Philippine Art Scene, Vera-Reyes, Inc.
1995 Birds of Paradise: Eight New Paintings, Lopez Museum Gallery, Philippines. 1998 Art Opus ’98: Hilaga Ug Sur Tower One, Ayala Avenue, Makati City, Philippines. 1998 Figures And Flowers, Galleria Duemila, Philippines. 1993 Red Abstracts: A Collection Of Modern Paintings, Metropolitan Museum of Manila, Mezzanine Gallery, Philippines. 1993 Shell Reunion Artists Shell Philippines, Shangri-La Plaza, Philippines. 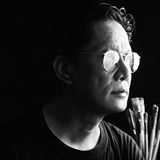 1990 Diptych Group Exhibition, The Brix Gallery, Philippines. 1990 Chairs: 30 Painters, Ayala Museum Gallery III, Philippines. 1977 Artists ’77, Galerie Bleue, Philippines. 1977 RARE (Religious Art Exhibition), UP Los Baños, Laguna, Philippines. 1977 Summer Impressions, Hidalgo Gallery, Philippines. 1976 UP Alumni Exhibition, Alumni Hostel, UP Diliman, Q.C., Philippines. 1975 The Nellie Sta. Maria Collection UP Main Library,Diliman, Q.C., Philippines. 1975 Four-Man Show Quad Gallery, Philippines. 1974 Three-Man Show Miladay Art Center, Philippines. 1974 Wilwayco-Ongteco Two-Man Show Sining Kamalig, Philippines. 1972 Silakbo University of the Philippines, Diliman, Philippines. 1972 Collection Of Prints Gallery One, Philippines. 1972 Watercolor Collections, Discovery Gallery, Philippines. 1972 Wilwayco-Salvosa Two-Man Show, Sining Kamalig, Philippines. 1970 Sulyap II, University of the Philippines, Diliman, Philippines. 1969 Assemblage, University of the Philippines, Diliman, Philippines. 1969 Sulyap I, University of the Philippines, Diliman, Philippines.